We’re well into another open water fishing season. Some of us have been out a lot, some not so much, and some are getting ready for that first trip of the year. The most important thing you can do to increase your chances for fishing success, in the eyes of many, is to use good line and to use the right line. Here’s what I mean. Line that has been on a reel for an extended period of time probably isn’t in ideal fishing form. It may not cast well due to memory. Memory is when line remembers the shape it has been in. If line has been wrapped around the spool of a reel for a long time, it might not want to straighten out as much as necessary when you are casting. Casting distance and ease of casting is not as good with line that has memory. Most modern lines have been formulated to reduce memory, but most still have some. It could be that, due to use, you don’t have as much line on the reel as you need for best performance. In a day of fishing you’ll probably re-tie several times, which reduces the amount of line on your reel, and you might get snagged a few times. That reduces the amount of line on your reel. Additionally, you should cut some line off regularly just to make sure there are no nicks caused by rocks or logs or whatever. Multiply these things by several fishing trips, and the reduction of line on your reel becomes a liability. Reels with too-little line don’t perform as well as reels with the proper amount of line. We want to choose the proper line also. For a good number of years, monofilament was about our only choice, and mono still does a good job for many functions. Lately though, fluorocarbons and braids have become very popular. They might give some performance benefits not available with monofilaments. For example, mono has some stretch in it, and if you have a lot of line out, a good hook set might be difficult. Braid has no stretch, and fluoro has just a bit of stretch, not much. You’ll get better hook-sets and sensitivity with these lines. They also cast better. Braids have a much smaller diameter than a comparable mono, so baits will run deeper with the braid. Here’s something that more and more anglers are doing to achieve the ultimate in sensitivity and hook-setting along with invisibility. They spool their reels with some backing, then attach braid to the backing. P-Line XTCB has become my braid of choice. It’s so strong and so manageable. To the braid, you tie a fifteen or twenty inch length of P-Line Tactical. Tactical is a new fluorocarbon that’s close to invisible under the water. It’s tough too. With this set-up you have a great system for jigging for walleyes or jig-worming and tubing for bass. Remember, your line is the only thing between you and the fish. Choose the right line and keep it in good shape and you’re going to win more often than that fish at the end of your line. 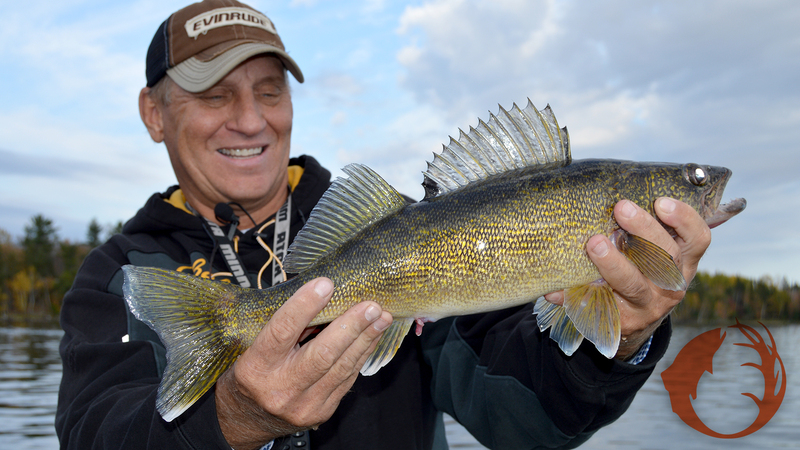 Photo: Mike Frisch and his boat partners found the walleyes deep on Kabetogama Lake last fall. A combination of braid and fluorocarbon lines allowed them to feel the light biters and get better hook-sets on these deep fish..